Blue is the color of the heavenly. Blue is the color of the Virgin Mary’s outfit. – for the whole world to see. …I pray God your whole spirit and soul and body be preserved blameless unto the coming of our Lord Jesus Christ. Triune colors: scarlet, purple and blue. Scarlet is the color of humanity and blood. Blue is the color of the heavenly and God. And they saw the God of Israel: and there was under his feet as it were a paved work of a sapphire stone (blue colored stone), and as it were the body of heaven in his clearness. The mix of scarlet and blue is purple, the color of royalty. 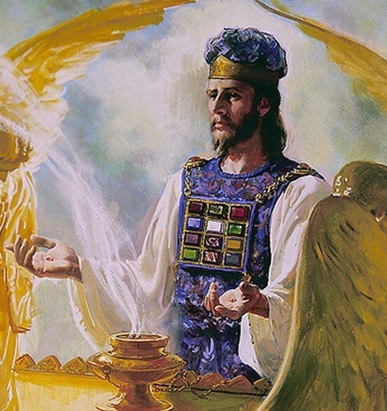 Under the Old Covenant, only the high priest (Aaron) had a legal right to wear the priestly garb of all 3 colors. …that they may make Aaron's garments to consecrate him, that he may minister unto me in the priest's office. …And they shall make the ephod of gold, of blue, and of purple, of scarlet, and fine twined linen, with cunning work. … And thou shalt make the robe of the ephod all of blue. Those cut off from the heavenly are revealed in God’s Word to only have the two colors – scarlet and purple. This imposter is cut off from the ‘blue’ heavenly. Who is this whore who bears the features of feminism? She is associated with Babylon – where they worshipped the Queen of Heaven – just like the Catholics call the Virgin Mary the Queen of Heaven. She sits over the city of seven mountains. The only matching city in Biblical times is Rome, Italy – in modern times the Vatican (Roman Catholic Church). …And the woman which thou sawest is that great city, which reigneth over the kings of the earth. 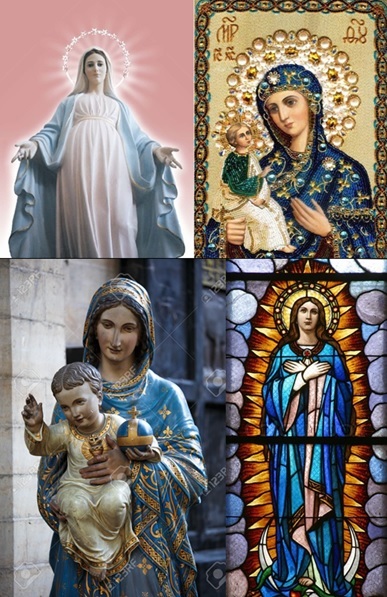 She disguises herself saying that she wears blue, just like the Virgin Mary is typically depicted. The Virgin Mary is the whore of Babylon, and she has no legal right to that blue clothing. The punishment is to strip of her clothing (and even her flesh). …these shall hate the whore, and shall make her desolate and naked, and shall eat her flesh, and burn her with fire. Who can find a virtuous woman? for her price is far above rubies (scarlet colored stone). Even the virtuous woman, like the whore of Babylon has scarlet, purple, but no blue. Even the virtuous woman, like the whore of Babylon, is cut off from God, as has no legal right to approach God without the headship of a man. Those who prop up the Virgin Mary could have chosen another Biblical name as a co-mediator to Christ. But they chose the Virgin Mary – a female – to legitimatize female authority – the tragedy of female authority.